Appleby's Cheshire Cheese for sale. Buy online at Zingerman's Mail Order. Gourmet Gifts. Food Gifts. The last traditional Cheshire you can buy. Sounds like "cheddar," but it's not. That's not to say it's totally different. 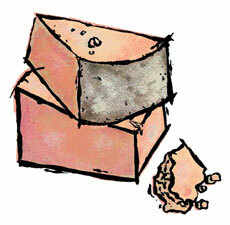 Like our English Farmhouse Cheddar, it's made in a drum shape from raw cow's milk from the Applebys' own herd. It's also cloth wrapped, which makes it age faster and, I think, gives it a more interesting flavor than wax rind cheeses. Similarities aside, the flavor of Cheshire is different. It's a little drier than cheddar. The texture is crumbly and light. The flavor tickles your tongue. Sticking with instincts and skills that have been honed over a half century, the Applebys make a great traditional cheese. It's the last farmhouse version of its kind. Buy it while you still can.